MahaNakhon Building is a luxury mixed-use skyscraper currently under construction in the Sathon central business district of Bangkok, Thailand. When completed, scheduled for later this year, it will be the highest building here in Bangkok at 314 meters. 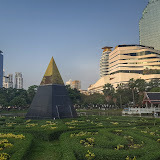 The MahaNakhon Building is located next to the Chongnonsi BTS Commuter Train Station and about a half a kilometer from the intersection of Sathon and Naradhiwas Roads. My photos show the current state of construction of the MahaNakhon Building, along with a look at the surrounding skyline. I will try to update this blog as the construction progresses.